America's economy has two storylines right now. The question is: which one will prevail by the end of 2015? 1. U.S. trade and manufacturing are getting crushed by the weak global economy and the strong dollar. 2. Americans are spending more on cars, in hotels and at restaurants. We'll get our latest look at the health of the American economy on Thursday when the report on third quarter U.S. economic growth is published. Overall, it's expected to be weak. The Atlanta Federal Reserve is projecting an anemic 0.9% growth. Bank of America is forecasting 1.2% growth. Others are expecting an equally tepid quarter of economic activity in the U.S. Compare that to a year ago, when the economy grew 4.3% in the third quarter. But now there's the diverging tales from two parts of the economy. 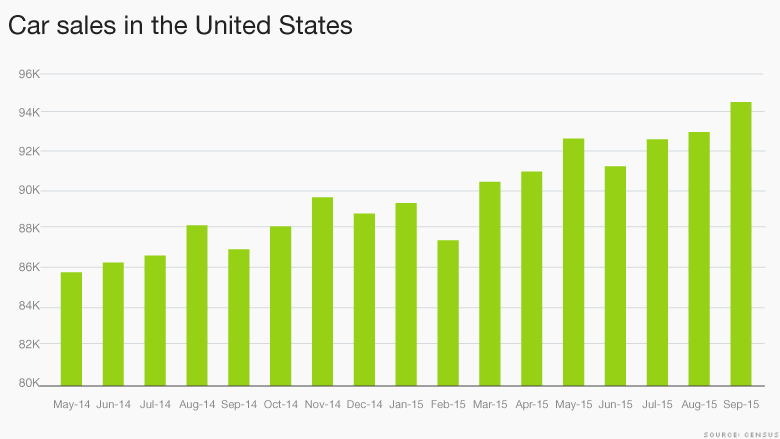 U.S. exports have declined this year for the first time since the Great Recession. The strong U.S. dollar makes products like iPhones more expensive -- and less attractive -- to foreign buyers. The dollar has gained 8% against the world's most-traded currencies, according to the St. Louis Federal Reserve. The strength of the dollar comes at a time when there's a global slowdown, led by China. Many of the countries that are struggling are big U.S. trade partners. Put the strong dollar and China slowdown together, and you have a major headwind for U.S. trade and manufacturers. America's manufacturing sector is on the verge of shrinking. The ISM manufacturing index has declined for three months in a row, hitting 50.2% in September. If the index goes below 50%, that means manufacturing is contracting. The silver lining is that trade isn't the biggest factor for U.S. economic growth. American consumers are. 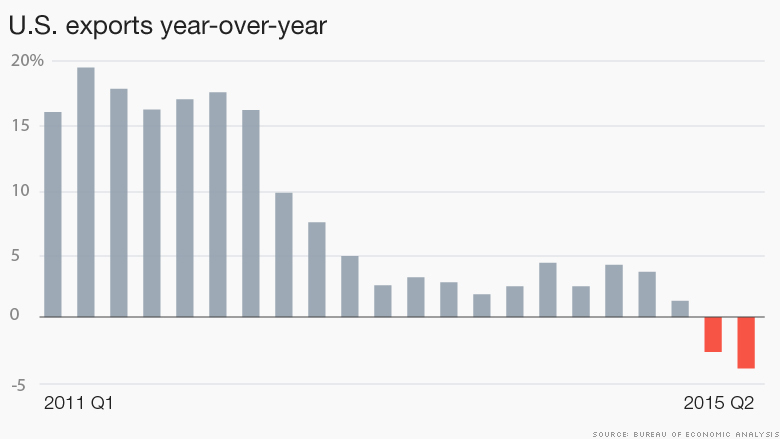 Americans are spending this year -- just selectively. 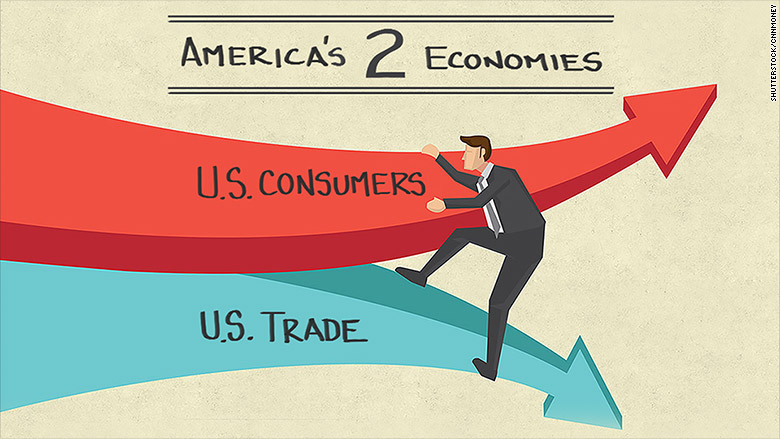 That's very important: consumers make up the majority of economic growth in the United States. If the consumer spends, America grows. "The consumer looks healthy to us," says Steve Chiavarone, a portfolio manager at Federated Investors. Retail sales overall have been just okay but other important indicators suggest a spending rally is already underway. Car sales hit an all-time high in September, restaurant sales have gained momentum and consumer confidence is higher than it was a year ago. When consumers buy big-ticket items like cars, that's a sign of confidence. And after all the debate about consumers NOT spending their gas savings, it appears some of those savings are being spent at restaurants. People are driving more and spending more in hotels, too. No wonder there's hope that holiday spending will be healthy. "The retailers are counting on a strong holiday season," says Ed Yardeni, CEO of Yardeni Research.